The identification, biology and management of Japanese beetles are reviewed in “Japanese Beetle in Minnesota Soybean.” Larvae of the Japanese beetle feed on roots of grasses and other plants. The adults emerge from soils in July and August and feed on many species of landscape plants, fruits, and field crops, such as soybean and corn. The feeding injury on leaves results in a characteristic lace-like pattern as the beetles feed on leaf tissues between the leaf veins. 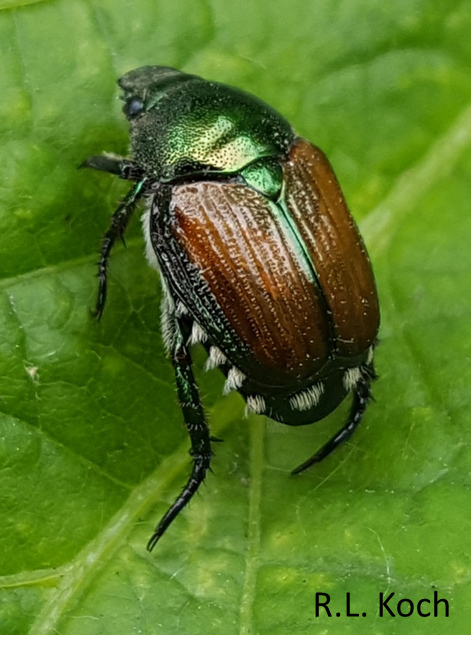 In Minnesota soybean, economic infestations of Japanese beetle have not yet been documented; however, the abundance of the beetles and their accumulating feeding injury to leaves could reach economic levels in some fields this year. Use the “Visual Guide for Estimation of Soybean Defoliation” to estimate percent defoliation for each leaf. Average the percent defoliation across the three leaves from each plant and then across the multiple plants to obtain the average percent defoliation per field. By using this method you ensure that the estimate of defoliation is representative of the whole canopy. If threshold levels of defoliation are reached and Japanese beetles are still present, most labeled insecticides will effectively suppress this pest (follow instructions on the insecticide label). However, continued scouting is required because this mobile pest can recolonize previously treated fields. When multiple defoliating pests occur (e.g., Japanese beetle and green cloverworm), defoliation from both pests should combined and related to the thresholds mentioned above. In corn, Japanese beetle can be a concern when they clip silks.